Let the Sunshine In, which will see a limited release next week in the U.S., arrives in the UK today and, for Little White Lies, Sophie Monks Kaufman asks Denis about one visual and one audial nod to Etta James. Denis: “Etta James was the exemplary woman for the film. 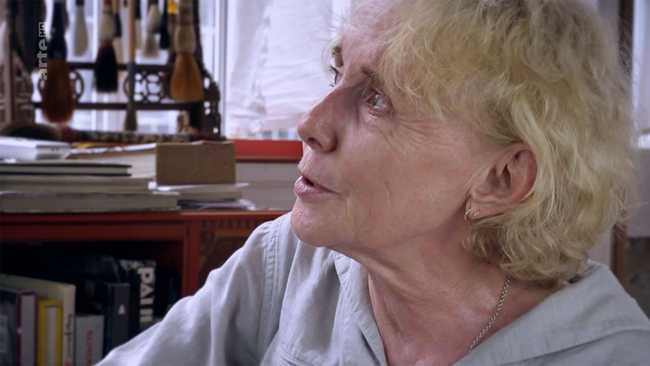 When I first spoke to Juliette I told her, ‘You have to consider Etta James, what kind of a woman she was.’ She wanted more love—more and more. . . . She is a wild, wild woman screaming for love.” For the BFI, Kaufman revisits ten “great films about female desire” and Amy Simmons presents a Claire Denis primer. Those fluent in French may want to watch Arte’s interview with Denis (15’39”) from which the image above is taken. “I’m not very interested in cinema at all anymore, it’s too confining for me,” James Benning told Maximilien Luc Proctor recently in Berlin. “And there’s too much arguing between the dominant cinema and people that are working outside of the dominant cinema. They shouldn’t even be talking. I have no understanding why. Their needs are completely different.” You’ll find the full interview at photogénie. “For the final installment of his so-called ‘trilogy of evil,’ which began in 1974 with General Idi Amin Dada, Barbet Schroeder profiles Buddhist monk Ashin Wirathu—one of the calmly speaking, saffron-robed leaders of the ongoing genocide against Rohingya Muslims in Myanmar.” Devika Girish talks with Schroeder about The Venerable W.
Also for Film Comment, Matt Morrison interviews Tamer El Said, director of In the Last Days of the City, “part diary and part documentary, its tone by turns dusky meditation and volcanic alarm.” It opens on April 27 at MoMA before rolling on to Los Angeles.